If it's not the heat, it's the absurdity! 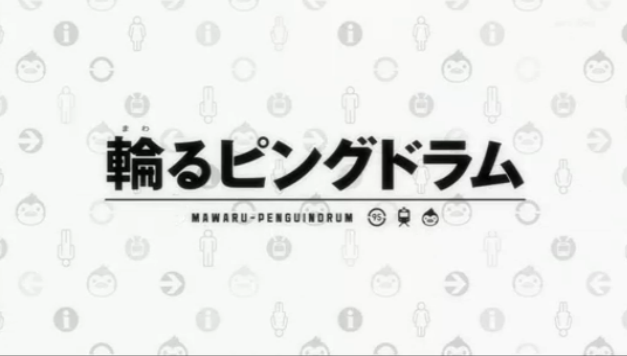 AniMaybe continues its look at Summer 2011's new anime shows with a look at Mawaru Penguindrum, an original anime series from Brain's Base and the creative mind of director Kunihiko Ikuhara. It's hardly an understatement to say that Kunihiko Ikuhara, the director for part of Sailor Moon and creator of Revolutionary Girl Utena, is an eccentric anime mind. Instead of embracing success after capturing the attention of critics and fans in the late '90s, Ikuhara pulled himself out of the limelight and disbanded Be-Papas, the collective behind Utena's manga and anime productions. While fans were mildly curious about his Schell Bullet manga/novel production, his work with anime had basically ground to a halt for years while he lived in Los Angeles. 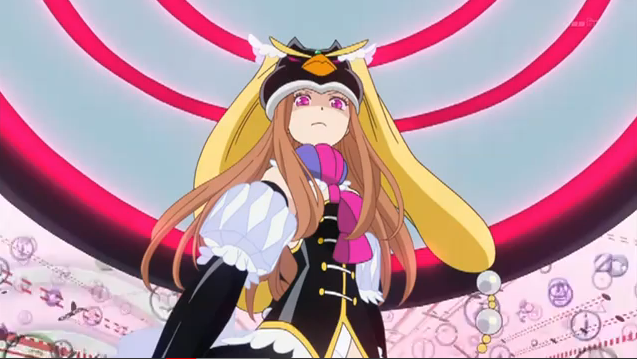 Ikuhara's return to anime is an interesting one in the form of Mawaru Penguindrum (lit. 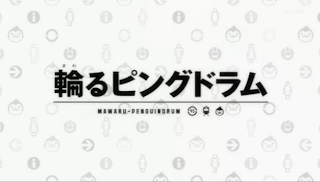 The Rotating Penguindrum), one of three shows in Summer 2011 to be animated by Brain's Base (Natsume Yûjinchô San, Kamisama Dolls). Not only did Ikuhara helm and co-write this series, but he also enlisted the help of Lilly Hoshino (Otome Yôkai Zakuro) for character designs and Yukari Hashimoto (Toradora!) for music production. The story of Mawaru Penguindrum revolves around orphaned twin brothers Shôma and Kanba and their terminally-ill little sister Himari. While they manage a decent life at their colorful kindergarten-like residence, the clock unfortunately runs out on Himari during a trip to the aquarium. 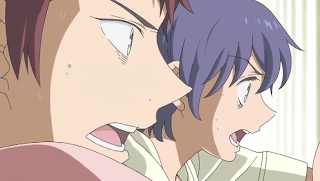 The brothers are grief-stricken at their misfortune, only to be shocked to see Himari bolt upright and shout "Survival Strategy! ", all thanks to a penguin-hat they had bought their sister. Apparently, whatever resided in that hat is keeping Himari alive for the sake of obtaining assistance from Shôma and Kanba. They must find something called the "Penguindrum", but are only given vague instructions during an elaborately colorful sequence involving robotic bears and a staircase resembling the curve of vertebrae. Luckily, the siblings are given some help in the form of three pudgy blue penguin assistants that only they can see. It's not surprising to kind Ikuhara blowing our minds once again with extravagant stock-footage transformation scenes and pensive symbolism, but it's terrific to see the details that make this show unique. Unnamed extras are replaced with expressionless people you'd see on public bathroom doors, and scene shifts are marked by subway station signs. 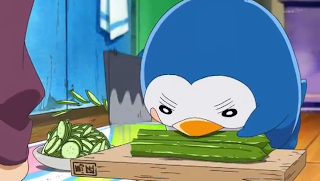 The animation is fluid and sound with appropriate attention to the main characters, while backgrounds that are meant to stand alone stand as works of art. The one thing I enjoyed mostly about Revolutionary Girl Utena was the surprising amusement provided by Chuchu, the show's absurd monkey/mouse comic-relief. 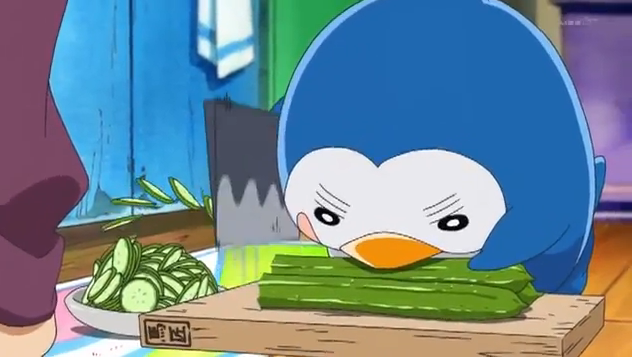 For Mawaru Penguindrum, Ikuhara cashed his chips in three times to mimic this interaction, and the comedy coming from the three penguins kept a smile on my face. Loyal housekeepers one moment, but unintentionally perverted and bumbling with a one-track mind the next, these three stooges make Badtz-Maru look like an amateur, and they don't even have to say a word. Three weeks down, and there's almost nothing in the show that discourages me from following it on a weekly basis. The animation is colorfully crisp, the music seasons the scenery almost perfectly, and the story has been set up like dominoes, each needing to fall to get to the end. The one big fear that I have is that the androgyny and personality flaws in the characters might push the envelope too close to resembling Utena, but I'm hoping that Ikuhara's time away from direction has taught him new tricks. While Mawaru Penguindrum may have flown under the radar during the spring, it could quite possibly be the biggest surprise to the anime industry this year. It took twelve years and the perfect storm for Ikuhara to return to the director's chair, which almost makes me fear that we won't see another great piece of work from Ikuhara until 2023.